The three-wheel inline skate was the first patented roller skate design. The Petitbled patent was issued in Paris, France, in 1819. M. Petitbled’s invention had three inline wheels which were either wood, metal or ivory. He thought his inline skate would allow a skater to simulate ice skating moves, but the wheel construction did not allow it, and the wheels kept slipping on hard surfaces. Patented by Jean Garcin, the ‘Cingar’ of 1828 was also a three-wheel inline skate. Garcin opened a skating rink rink to teach skating and even wrote a book called Le Vrai Patineur (‘The True Skater’). Garcin had to close his rink because of the number of skating injuries to patrons. The first patent for roller skates equipped with ball bearings was by J. Gidman in 1852. He had to wait 30 years to see them in use on skates, but the writing was already on the wall for inline skates: if skates were to become really popular they needed to be easier to use. 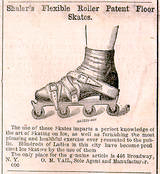 The Woodward skate of 1859 had four vulcanized rubber wheels; this skate was used by Jackson Haines, the founder of modern figure skating, for exhibitions. James Plimpton’s quad skates of 1863 finally sealed the fate of inline models, as they provided greater control and were much easier to use. Jean Garcin’s Cingar skate had a brief revival at the 1867 Exposition Universelle in Paris, but by now Plimpton’s quad skate had made all inline roller skates obsolete.